A few years ago a work colleague, J, wandered to my desk. J was smart and educated – and definitely not a follower of the gospel. But he was somewhat curious so we had some warm and open conversations between us. He had never really looked at the Bible so I had encouraged him to investigate it. One day he came into my office with a Bible to show that he was taking a look. He had opened it randomly in the middle. I asked him what he was reading. Our conversation went something like this. “I guess I am reading about the crucifixion of Jesus”, J replied. J did not realize that the Psalms were not the gospel accounts of Jesus’ life written by his contemporaries. Psalms were sacred Hebrew hymns written 1000 years before Jesus by inspired sages. J had only heard some stories about Jesus, including his crucifixion, and randomly opening his Bible, read what seemed to describe the crucifixion. Not knowing any better, he just assumed it was the story of the crucifixion which is remembered around the world annually on what is called Good Friday. We had a chuckle over his first mis-step in Bible reading. Psalms are ancient Hebrew hymns and were written by Rsi David 3000 years ago. Then I asked J what he saw in Psalm 22 that made him think he was reading about Jesus’ crucifixion. Thus began our little study. I invite you to consider some of the similarities J noticed by placing the passages side-by-side in a table. To help I have color matched the texts that are similar. (Matthew 27:31-48) ..Then they led him (Jesus) away to crucify him…. 39 Those who passed by hurled insults at him, shaking their heads 40and saying, “… save yourself! Come down from the cross, if you are the Son of God!” 41In the same way the chief priests, the teachers of the law and the elders mocked him. 42 “He saved others,” they said, “but he can’t save himself! He’s the king of Israel! Let him come down now from the cross, and we will believe in him. 43 He trusts in God. Let God rescue him now if he wants him,…About the ninth hour Jesus cried…“My God, My God, Why have you forsaken me?” …48 Immediately one of them ran and got a sponge. He filled it with wine vinegar, put it on a staff, and offered it to Jesus to drink. (Mark15:16-20)16 The soldiers led Jesus away… They put a purple robe on him, then twisted together a crown of thorns and set it on him. 18 And they began to call out to him, “Hail, king of the Jews!” 19 Again and again they struck him on the head with a staff and spit on him. Falling on their knees, they paid homage to him. 20 And when they had mocked him, they took off the purple robe and put his own clothes on him. Then they led him out to crucify him…37 With a loud cry, Jesus breathed his last. (John19:34) they did not break his legs..., pierced Jesus’ side with a spear, bringing a sudden flow of blood and water.…they crucified him… (John20:25) [Thomas] unless I see the nail marks in his hands ,…”…(John20:23-24) When the soldiers crucified Jesus, they took his clothes, dividing them into four shares, one for each of them, with the undergarment remaining…Let’s not tear it”, they said,”Let’s decide by lot who gets it”… 1 My God, my God, why have you forsaken me? That J made the logical but wrong conclusion that Psalm 22 was an eye-witness account of the Good Friday crucifixion, should make us ask a question. How do we explain the similarity between the crucifixion accounts and Psalm 22? Is it coincidence that the details match so precisely as to include that the clothes would be divided (seamed clothes were split along the seams and divided among the soldiers) AND have lots cast (if torn the seamless garment would be ruined so they gambled for it). Psalm 22 was written before crucifixion was invented but it still describes its various details (piercing of hands and feet, bones being out of joint – by being stretched as the victim hangs). In addition, the Gospel of John states that blood and water flowed out when the spear was thrust in Jesus’ side, indicating a fluid buildup around the heart. Jesus thus died of a heart attack. This matches the Psalm 22 description of ‘my heart has turned to wax’. Psalm 22 was written as if Jesus’ crucifixion was being seen. But how so, since it was composed 1000 years beforehand? 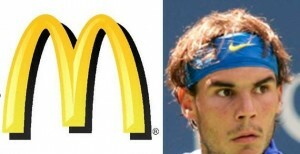 Jesus, in the Gospels, argued that these similarities were prophetic. God inspired Old Testament prophets hundreds of years prior to Jesus’ life to predict details of his life and death so that we can know that this was all in the plan of God. Prophetic fulfillment would be like having a Divine signature on these events of Good Friday since no human could foresee the future in such detail. This is evidence of God’s work and intervention in history. Their historical testimony agrees with the gospels that Jesus was crucified. This is important because many of the details in Psalm 22 are simply particulars of the act of being crucified. If the gospel writers were going to make up the actual events to make them ‘fit’ Psalm 22 then they would basically have had to make up the whole crucifixion. Yet no one from that time denied his crucifixion, and the Jewish historian Josephus explicitly states that this is how he was executed. Also, Psalm 22 does not end at v.18 as in the table above. It continues on. Note the triumphant mood at the end –after the person is dead! This is not talking about the details of events of this person’s death. Those details were dealt with in the beginning of the Psalm. The psalmist is now addressing the legacy of that person’s death with ‘posterity’ and ‘future generations’ (v.30). That is us living 2000 years after Jesus’ crucifixion. The Psalmist tells us that ‘posterity’ which follows this ‘pierced’ man who died such a horrible death will ‘serve’ him and be ‘told about him’. Verse 27 predicts the geographic scope of the impact – going to the ‘ends of the earth’ and among ‘all families of nations’ to cause them to ‘turn to the LORD’. Verse 29 predicts that ‘those who cannot keep themselves alive’ (since we are mortal that means all of us) will one day kneel before him. The righteousness of this man will be proclaimed to people who were not yet alive (the ‘yet unborn’) at the time of his death. Psalm 22’s conclusion has nothing to do with whether the gospel accounts borrowed from it or made up the crucifixion events because it is now dealing with a much later era – that of our time. The gospel writers, living in the 1st century could not ‘make up’ the impact of the death of Jesus down to our time. They did not know what that impact would be. One could not make a better prediction of the legacy of Jesus than Psalm 22 does. Even simply noting the annual worldwide Good Friday celebrations remind us of his global impact two thousand years after his death. These fulfill the conclusion of Psalm 22 as precisely as the earlier verses predicted the details of his death. Who else in world history can make a claim that details of his death as well as the legacy of his life into the distant future would be predicted 1000 years before he lived? Here is the entire gospel account for Good Friday that Psalm 22 foresaw and here its gift for you is explained. This entry was posted in Journey through the Veda Pusthakan (Bible) and tagged bible prophecies of Jesus, psalm 22, psalm 22 prophecy on 06/25/2018 by [email protected]. We have learned how the ancient Vedas foresaw the Coming Person. We started at the beginning of the Purusasukta in the Rg Veda. Then we continued with the Hebrew Vedas, suggesting that what both the Sanskrit and Hebrew Vedas (Bible) predicted was fulfilled by Yeshua Satsang (Jesus of Nazareth). So was Jesus of Nazareth this prophesied Purusa or Christ? Was his coming just for a certain religious group, or was his coming for all – including all castes, from the Varna to the Avarna. ūrūtadasya yad vaiśyaḥ padbhyāṃ śūdro ajāyata 11 When they divided Puruṣa how many portions did they make? 12 The Brahman was his mouth, of both his arms was the Rājanya made. This is the first mention of Castes or Varna in the Sanskrit Vedas. It speaks of the four Castes as separating out from Purusa’s body. The Brahmin Caste/Varna came from his mouth, the Rajanya (today known as Kshatriya Caste/Varna) from his arms, the Vaishya Caste/Varna from his thighs, and the Shudra Caste from his feet. For Jesus to be Purusa he must be able to represent everybody. We saw that ‘Christ’ is an ancient Hebrew title meaning ‘ruler’ – the Ruler of rulers in fact. As ‘the Christ’, Jesus fully identifies with and can represent the Kshatriya. We also saw that as ‘the Branch’ Jesus was also prophesied to come as Priest, so he fully identifies with and can represent the Brahmin. In fact, the Hebrew prophecy indicated that he would unite the two roles of Priest and King into one person. Here God is speaking prophetically to the Coming One, saying that He would not be trading in things, but he would be trading for people – in exchange for his life. So the Coming One would be a merchant, trading in the freeing of people. As a merchant he identifies with and can represent the Vaishya. The Coming Branch, who was Priest, Ruler and Merchant, was also a Servant – Shudra. Isaiah prophesied in great detail of his role as Servant (Shudra). In this prophecy God advises all nations ‘distant’ from Israel (that includes you and me) to pay attention to the work of this Shudra. Though coming from the Hebrew/Jewish race, the prophecy stated that the service of this Servant would ‘reach to the ends of the earth’. Though Jewish, Jesus’ service has indeed touched all nations on earth as prophesied of this Servant. As Servant, Jesus fully identified with and can represent all the Shudra. To mediate for all peoples Jesus would also have to represent the Avarna, or Scheduled Castes, Tribals and Dalits. How would he? Another prophecy from Isaiah predicted that he would be completely broken and despised. He would be viewed as Avarna by the rest of us. Here is the prophecy in full with some explanations inserted. You will notice that it speaks of a ‘He’ and ‘him’ so it is prophesying a coming man. Since the prophecy uses the image of ‘shoot’ we know it is referring to the same Branch who was Priest and Ruler. But the description is different. In spite of being the ‘shoot’ before God (i.e. The Banyan Branch), this Man would be ‘despised’ and ‘rejected’, full of ‘suffering’ and ‘held in low esteem’ by others. He would literally be regarded as untouchable. This coming one would also be able to represent those as broken as Untouchables of the Scheduled Tribes (Vanvasi) and Backwards Castes – the Dalits. We sometimes judge the misfortune of others, or look at those who have a low position in society, as a consequence, or karma, of their sins. This prophecy states that similarly the afflictions of this man will be so great that we could think he is being punished by God. This is the reason he will be despised. But he will not be punished for his own sins – but rather for ours. He will bear an awful burden – for our healing and peace. These prophecies were fulfilled in the crucifixion of Jesus of Nazareth, who was ‘pierced’ on a cross, stricken and afflicted. Yet this prophecy was written 750 years before he lived. In being held in low esteem, and in his suffering, Jesus fulfilled this prophecy and is now able to represent all Backward Castes and Tribals. It is our sin and our going astray from dharma which requires that this man carry our iniquities or sins. 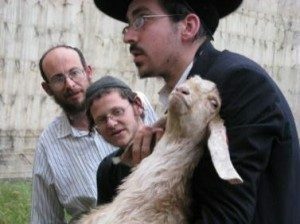 He would be willing to go peacefully to the slaughter in our place, not protesting or even ‘opening his mouth’. This was fulfilled precisely in the way which Jesus went willingly to the cross. The prophecy stated that this man would be ‘cut off’ from the land of the living’, which was fulfilled when Jesus died on the cross. Jesus died condemned as a ‘wicked’ man even though ‘he had done no violence’ and no ‘deceit was in his mouth’. Yet, he was buried in the tomb of Joseph of Arimathea, a rich Priest. Thus it was fulfilled that Jesus was both ‘assigned a grave with the wicked’ but also ‘with the rich in his death’. This cruel death was not some terrible accident or misfortune. It was ‘the LORD’s will’. Because the ‘life’ of this man would be an ‘offering for sin’. Those of us among the ‘many nations’ that have ‘gone astray’. When Jesus died on the cross, it was to cleanse all of us, regardless of nationality or social position, from sin. Here the tone of the prophecy changes and becomes triumphant. After this terrible ‘suffering’ (of being ‘despised’ and ‘cut off from the land of the living’ and assigned ‘a grave’), this Servant will see ‘the light of life’. He will come back to life! And in so doing this Servant will ‘justify’ many. To ‘justify’ is the same as getting ‘righteousness’. We saw that Rsi Abraham was ‘credited’ or given ‘righteousness’. It was given to him simply because of his trust. In a similar way this Servant who would be so low as to be untouchable will justify, or credit righteousness to ‘many’. This is exactly what Jesus accomplished by rising from the dead after his crucifixion and now he is able to ‘justify’ us. Though this oracle was written 750 years before Jesus lived, it was fulfilled in such detail by him that it proves this was the plan of God. It also shows that Jesus can represent the Avarna, those often held in the lowest esteem. In fact, he came to represent, bear and cleanse their sins, as well as the sins of the Brahmin, Kshatriya, Vaishya and Shudra. This entry was posted in Journey through the Veda Pusthakan (Bible) and tagged avarna, castes, jesus and castes, jesus and tribals, shudra, varna on 05/11/2018 by [email protected]. Isaiah first wrote of the coming Branch. A ‘he’ from the fallen dynasty of David, possessing wisdom and power was coming. Jeremiah followed by stating that this Branch would be known as the LORD – the Jewish name for Creator God, and would be our righteousness. The Branch! 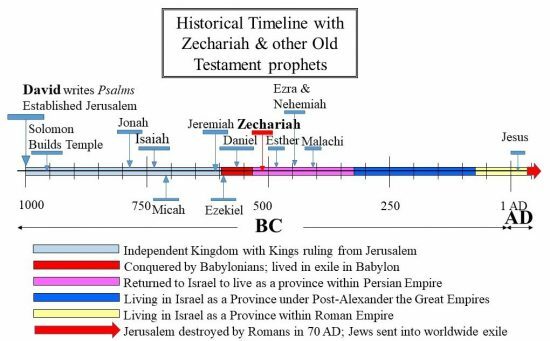 Started by Isaiah 200 years before, continued by Jeremiah 60 years earlier, Zechariah carries on further with ‘The Branch’ even as the Royal dynasty was now cut down. Like a banyan tree this Branch has continued by propagating roots from a dead stump. The Branch is now called ‘my servant’ – the servant of God. 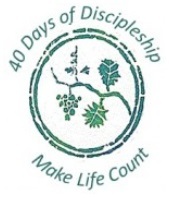 In some way the High Priest Joshua in Jerusalem at 520BCE, colleague of Zechariah, was symbolic of this coming Branch. But how? It says that in ‘a single day’ the sins will be removed by the LORD. How would that happen? Here, against previous precedent, the high priest in Zechariah’s day (Joshua) was to put on the king’s crown symbolically as the Branch. (Remember Joshua was ‘symbolic of things to come’). Joshua, the High Priest, in putting on the kingly crown, foresaw a future uniting of the King and Priest into one person – a priest on the King’s throne. Furthermore, Zechariah wrote that ‘Joshua’ was the name of the Branch. What did that mean? As you can see in the figure Joshua is an English transliteration of the original Hebrew name ‘Yhowshuwa’. Quadrant #1 shows how Zechariah wrote ‘Joshua’ in 520 BCE in Hebrew. It is transliterated ‘Joshua’ in English (#1=> #3). 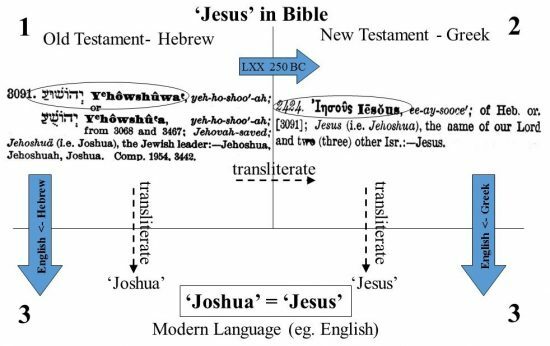 ‘Yhowshuwa’ in Hebrew is the same as Joshua in English When the LXX was translated from Hebrew to Greek in 250 BCE Yhowshuwa was transliterated to Iesous (#1 => #2). ‘Yhowshuwa’ in Hebrew is the same as Iesous in Greek. When the Greek is translated to English, Iesous is transliterated to ‘Jesus’ (#2 => #3). Iesous in Greek is the same as Jesus in English. Jesus was called Yhowshuwa when spoken to in Hebrew, but in the Greek New Testament his name was written as ‘Iesous’ – exactly how the Greek Old Testament LXX wrote that name. When the New Testament is translated from Greek to English (#2 => #3) ‘Iesous’ is transliterated to the familiar ‘Jesus’. So the name ‘Jesus’ = ‘Joshua’, with ‘Jesus’ going through an intermediate Greek step, and ‘Joshua’ coming directly from the Hebrew. Both Jesus of Nazareth, and Joshua the High Priest of 520BCE had the same name, being called ‘Yhowshuwa’ in their native Hebrew. In Greek, both were called ‘Iesous’. This is similar to how बरगद = bargad (transliteration) = banyan = Ficus benghalensis (scientific Latin name). Now the prophecy of Zechariah makes sense. The prediction, made in 520 BCE, was that the name of the coming Branch would be ‘Jesus’, pointing directly to Jesus of Nazareth. This coming Jesus, according to Zechariah, would unite the King and Priest roles. What was it that the priests did? Representing the people they offered sacrifices to God to atone for sins. The priest covered the sins of the people by sacrifice. Similarly, the coming Branch ‘Jesus’ was going to bring a sacrifice so that the LORD could ‘remove the sin of this land in a single day’ – the day Jesus offered himself as the sacrifice. With the removal of sin, the power of death would lose its authority over us. Jesus of Nazareth is well-known outside the gospels. The Jewish Talmud, Josephus and all other historical writers about Jesus, both friend and enemy, always referred to him as ‘Jesus’ or ‘Christ’, so his name was not invented in the Gospels. 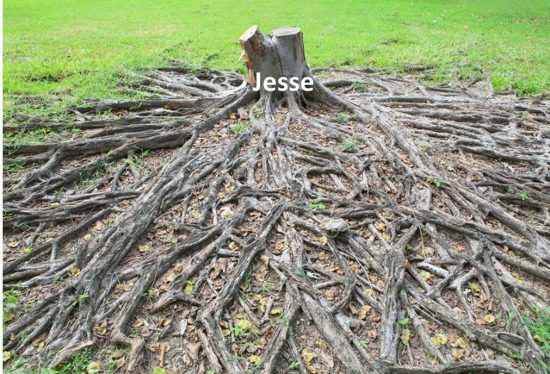 Jesus comes ‘from the stump of Jesse’ since Jesse and David were his ancestors. Jesus possessed wisdom and understanding to a degree that sets him apart from others. His shrewdness, poise and insight continue to impress both critics and followers. His power through miracles in the gospels is undeniable. One may choose not to believe them; but one cannot ignore them. Jesus fits the quality of possessing exceptional wisdom and power that Isaiah predicted would one day come from this Branch. Now think of the life of Jesus of Nazareth. He certainly claimed to be a king – The King in fact. This is what ‘Christ‘ means. But what he did while on earth was actually priestly. The priest’s job was to offer acceptable sacrifices on behalf of the Jewish people. The death of Jesus was significant in that, it also, was an offering to God, on our behalf. His death atones for the sin and guilt for any person, not just for the Jew. The sins of the land were literally removed ‘in a single day’ as Zechariah had predicted – the day Jesus died and paid for all sins. In his death he fulfilled all the requirements as Priest, even as he is mostly known as ‘The Christ’ or The King. Then in his resurrection, he showed his power and authority over death. He did bring the two roles together. The Branch, the one that David long ago called the ‘Christ’, is the Priest-King. And his name was predicted 500 years before his birth by Zechariah. In other words, Jesus claimed that his life was prophesied hundreds of years previously in the Old Testament. Since human insight cannot predict hundreds of years into the future, Jesus said this was evidence to verify that he had really come as God’s plan for mankind. The Old Testament is available still for us today to verify this for ourselves. Let us summarize what the Old Testament prophets have predicted thus far. Jesus’ coming was hinted at the beginning of human history. Then Abraham foretold the location where Jesus was to be sacrificed while the Passover foretold the day of the year. We saw that Psalm 2 was where the title ‘Christ’ was used foretell a coming King. Here we have seen that his lineage, priestly career, and name were predicted. Can you think of anyone else in all of history whose life was even as remotely predicted as Jesus of Nazareth’s was by the many Old Testament prophets? The riddle of how and what the Branch was prophesied to do, mirrors the story of Savitri and Satyavan. Like the pure Savitri, the Branch would face death for his love. But instead of the love of a wife for her husband, the Branch would have powerful sacrificial love that would gain him a spiritual wife, who would be rescued from death forever. So, peoples of all nations – including you – are invited to experience both deliverance from death and richness of the Tree of Life – a truly immortal banyan tree. But the Old Testament rishi-prophets prophesy for us how this would first required that the Branch be ‘cut off’, as we see next. This entry was posted in Journey through the Veda Pusthakan (Bible) and tagged jesus is the branch, priest and king in bible, prophecies of Jesus, tree of life, trees in bible on 11/06/2017 by [email protected]. The Vat-vriksha, Bargad or Banyan tree is central to South Asian spirituality and is the national tree of India. It is associated with Yama, the God of death, so is often planted near crematoria. Because of its ability to re-sprout it has great longevity and is a symbol of immortality. It was also by a Banyan tree that Savitri bargained with Yama for the return of her dead husband and King Satyavan so that she could get a son – remembered in the annual celebration of Vat Purnima and Vat Savitri. A similar account is found in the Old Testament of the Bible. There is a dead tree … coming to life … representing a new son from a dead line of kings. The major difference is that this account is a future-looking prophecy and was developed by different prophets (rishi) over hundreds of years. This composite story was predicting someone coming. The man who first told this story was Isaiah (750 BCE) which later Old Testament rishi-prophets further developed – in the Branch from the dead tree. 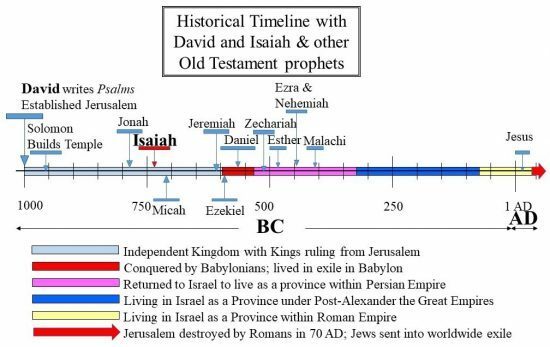 Isaiah lived in historically verifiable time, seen in the timeline below. This timeline is taken from the history of the Jews. You can see that Isaiah’s book was written in the period of David’s Royal dynasty (1000 – 600 BCE) ruling from Jerusalem. In Isaiah’s time (750 BCE) the dynasty and the Jewish kingdom was corrupt. Isaiah pleaded for the kings to return back to God and to the good practice and spirit of Moses’ Ten Commandments. But Isaiah knew that Israel would not repent, and so he foresaw that the Kingdom would be destroyed and the kings cease to rule. He used an image for the royal dynasty, picturing it like a great banyan tree. This tree had at its root Jesse, the father of King David. On Jesse the dynasty of kings was started with David, and continued with his successor, King Solomon, and so on. As illustrated in the image below, the tree continued to grow and develop as the next son in the dynasty ruled. The cutting down of this ‘tree’ happened 150 years after Isaiah, around 600 BCE, when the Babylonians conquered Jerusalem, dragging its people and king into exile in Babylon (the red period in the timeline above). This started the exile of the Jews – some of whom migrated to India. 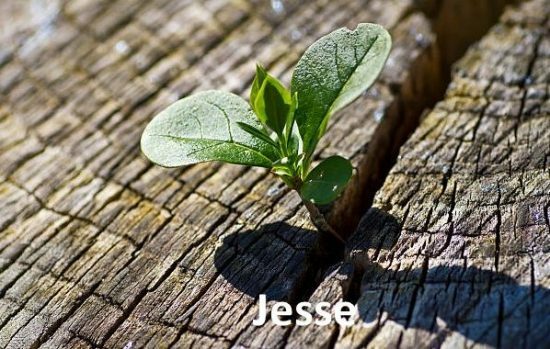 Jesse was the father of King David, and so was the root of David’s Dynasty. 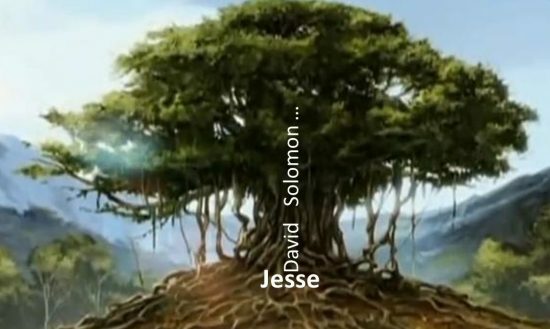 The ‘stump of Jesse’ was therefore a metaphor of this shattering of David’s dynasty. In the story of Savitri and Satyavan there was one dead king’s son – Satyavan. In the prophecy of the stump the whole line of kings would come to an end and the dynasty itself would die. But the prophecy looked further into the future than just the cutting down of the kings in using an image associated with the banyan tree. When banyan seeds begin life they often do so on the stumps of other trees. The stump is a host to the germinating banyan tree. But once the banyan seedling is established it will outgrow and outlive the stump host. This shoot foreseen by Isaiah would be like a banyan tree as a new shoot would go up from its roots – to form a Branch. Isaiah used this imagery and prophesied that one day in the far future a shoot, known as the Branch, would emerge from the dead stump, just like banyan shoots sprout from tree stumps. This Branch is referred to as a ‘him’ so Isaiah is talking about a specific man, coming from the line of David after the dynasty would be cut down. This man would have such qualities of wisdom, power, and knowledge it would be as if the very Spirit of God would be resting on him. A banyan tree outgrowing its host stump. Soon it will be a tangle of propagating roots and shoots. The banyan tree in mythology is mentioned in many scriptures as symbolic of immortality. 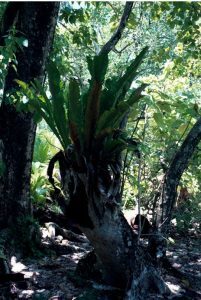 Its aerial roots grow down into the soil forming additional trunks. It symbolizes longevity and thus represents the divine creator. This Branch foreseen by Isaiah in 750 BCE would have many similar divine characteristics, and last long after the dynasty ‘stump’ disappeared. Jeremiah expanded on Isaiah’s Branch image of David’s dynasty. The Branch will also be a King. But not a King like the previous kings of David who had been reduced to a dead stump. The difference with this Branch is seen in his name. He would bear the very name of God (‘The LORD’ – The Jewish name for God), so like a banyan tree this Branch would be an image of the Divine. He will also be ‘our’ (us humans) Righteousness. So, since the devil has power, like Yama in the story of Savitri and Satyavan, to dispute over the body of a noble prophet like Moses, then he certainly has power over us in death – because of our sin and corruption. Even the angels recognize that only the Lord – the Creator God – has the authority to rebuke the devil in death. And here, in the ‘Branch’ is a promise that in the future the LORD would impart ‘righteousness’ to us so we can have victory over death. But how? Zechariah fills in further details as he develops this theme, predicting even the name of the coming Branch with details that parallels the story of Savitri and Satyavan defying death (Yama) – which we look at next. This entry was posted in Journey through the Veda Pusthakan (Bible) and tagged banyan tree and branch, isaiah and the branch, vat sivitri and bible on 10/26/2017 by [email protected]. “I guess his last name was ‘Christ’ but I am not sure”. Put that way, they realize that ‘Christ’ is not Jesus’ last name. So, what is ‘Christ’? Where does it come from? What does it mean? Surprising to many, ‘Christ’ is a title that means ‘ruler’ or ‘rule’. It is not unlike the title ‘Raj’, as in the British Raj that ruled South Asia for many decades. To see this, we need to first understand some translation basics. Translators sometimes choose to translate by similar sound rather than by meaning, especially for names and titles. This is known as transliteration. For example, the Kumbh Mela is an English transliteration from the Hindi कुंभ मेला. Even though मेला means ‘fair’ or ‘festival’ it is usually brought into the English by similar sound to Kumbh Mela rather than Kumbh Fair. For the Bible, translators had to decide whether names and titles would be better in the translated language through translation (by meaning) or transliteration (by sound). There is no specific rule. The Bible was first translated in 250 BC when the Hebrew Old Testament was translated into Greek – the international language at that time. This translation is known as the Septuagint (or LXX) and it was very influential. Since the New Testament was written in Greek, its many quotations of the Old Testament were taken from the Septuagint. The original Hebrew Old Testament (written from 1500 – 400 BC) is shown in quadrant #1. Because the Septuagint was a 250 BC Hebrew –> Greek translation it is shown as an arrow going from quadrant #1 to #2. The New Testament was written in Greek (50–90 AD), so this means #2 contains both Old and New Testaments. In the bottom half (#3) is a modern language translation of the Bible. To get there the Old Testament is translated from the original Hebrew (1 -> 3) and the New Testament is translated from the Greek (2 -> 3). The translators must decide on names and titles as explained previously. This is shown with the green arrows labeled transliterate and translate, showing that the translators can take either approach. Now we follow the process as above, but this time focusing on the word ‘Christ’. Where does ‘Christ’ come from in the Bible? We can see that in the original Hebrew Old Testament the title is ‘מָשִׁיחַ’ (mashiyach) which literally means an ‘anointed or consecrated’ person such as a king or ruler. Hebrew kings of the Old Testament period were anointed (ceremonially rubbed with oil) before they became king, thus they were anointed ones or mashiyach. Then they became rulers, but their rule was to be in submission to the heavenly rule of God, according to His laws. In that sense a Hebrew king in the Old Testament was like the former Raj of South Asia. The Raj ruled the British territories of South Asia, but was to do so under submission to the government in Britain, subject to its laws. The Old Testament prophesied the coming of a specific mashiyach (with a definite article ’the’) who would be a unique king. When the Septuagint was translated in 250 BC, the translators chose a word in the Greek with a similar meaning, Χριστός (sounds like Christos), based from chrio, which meant to rub ceremonially with oil. So the Hebrew ‘mashiyach’ was translated by meaning (not transliterated by sound) to Χριστός (pronounced Christos) in the Greek Septuagint. The New Testament writers continued to use the word Christos to identify Jesus as this prophesied ‘mashiyach’. But when we come to European languages, there was no obvious word with a similar meaning so the Greek ‘Christos’ was transliterated to ‘Christ’. The word ‘Christ’ is a very specific title with Old Testament roots, by translation from Hebrew to Greek, and then by transliteration from Greek to modern languages. 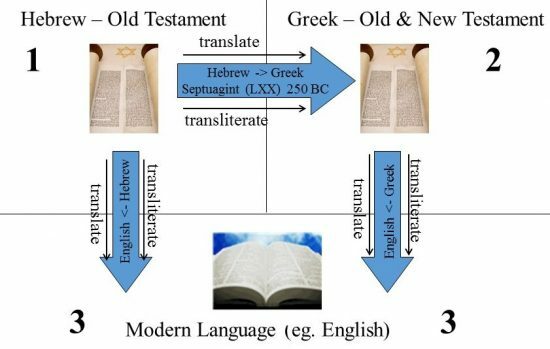 The Hebrew Old Testament is translated directly into modern languages and translators have made different choices regarding the original Hebrew ‘mashiyach’. 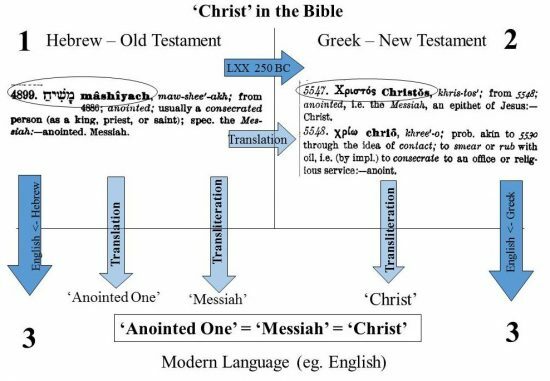 Some Bibles transliterate ‘Mashiyach’ to variations of ‘Messiah’, others translate by meaning ‘Anointed One’, and others transliterate (by sound) into variations of ‘Christ’. One Hindi word for Christ (मसीह) is transliterated from Arabic, which in turn was transliterated from the original Hebrew. So its pronunciation ‘maseeh’ is close to the original Hebrew, while another word क्राइस्ट is transliterated from English ‘Christ’ and sounds like ‘Kraist’. The Nepali word for Christ (ख्रीष्टको) is transliterated from the Greek Christos and so is pronounced Khrīṣṭakō. Because we do not usually see the word ‘Christ’ in the Old Testament, the connection to the Old Testament is not always apparent. But from this study we know that the Biblical ‘Christ’=’Messiah’=’Anointed One’ and that it was a specific title. With this insight, let’s make some observations from the Gospel. Below is the reaction of King Herod when the Magi came looking for the King of the Jews, a well-known part of the Christmas story. Notice, ‘the’ precedes Christ, even though it is not referring specifically about Jesus. You can see that the idea of ‘the Christ’ was well understood between Herod and his advisors – even before Jesus was born – and it is used here without referring specifically to Jesus. This shows ‘Christ’ comes from the Old Testament, commonly read by people in the 1st century (like Herod and his advisors) in the Greek Septuagint. ‘Christ’ was (and still is) a title, not a name, denoting a ruler or King. This is why Herod ‘was disturbed’ because he felt threatened at the possibility of another King. We can dismiss the ridiculous notions that ‘Christ’ was a Christian invention or an invention by someone like Emperor Constantine of 300 AD . The title was in use hundreds of years before there were any Christians or before Constantine came to power. The title ‘Christ’ first appears in the Psalms, written by David ca 1000 BC – far before the birth of Jesus. Let’s look at these first occurrences. Here is the same passage but based from the Greek translation Septuagint. You can now ‘see’ Christ in this passage like a reader of the 1st century would have. The Psalms continue with more references to this coming Christ. I put the Hebrew-based passage side-by-side with a transliterated Greek one with ‘Christ’ in it so you can see it. You can see that Psalm 132 speaks in the future tense (“…I will make a horn for David…”). This is important when understanding Christ. It is as clear as can be that the Old Testament makes future-looking predictions about ‘the Christ’. Herod was aware of this. He just needed his advisers for the specifics of these predictions. The Jews have always been known to be waiting for their Messiah (or Christ). The fact that they are still waiting has nothing to do with Jesus or the New Testament but rather has to do with these future-looking predictions and prophecies in the Old Testament. This Christ (or Messiah or Anointed One) prophesied in the Old Testament was similar in one important respect to the former British Raj. As the Raj ruled over the nations in British India, while still under the authority of the government in Britain, the Christ was prophesied to one day rule over ‘the nations’ (Psalm 2:1) within the authority of God. If Jesus of Nazareth was this prophesied Christ as the New Testament declares, then there are also some important differences between the Raj and the ‘Christ’. The Raj came in military power and enforced outward submission through greater might. Jesus came in such humility and servanthood that the powers in his day, like Herod, were caught by surprise. Jesus the Christ first meets our need for freedom from sin and death, and by loving us first, seeks, even still today, to win our loyalty inwardly from our hearts. Only after he has won over people in this way to Himself from all nations will he establish his outward rule. Jesus likened this to an invitation to a great wedding feast, and many with money and power had excuses to decline the invitation. The poor, crippled, blind and lame would show up at this feast in great numbers (see Matthew 22). Many of the wealthy, powerful and connected in this life will miss out on the benefits of His rule. So the question of whether Jesus is this Old Testament Christ is important to consider. Fortunately, the Old Testament can help us. Since the Old Testament clearly predicts the future, it stands in very small company across the vast sea of human literature. It is like the lock of a door. A lock is designed with a certain shape so that only a specific ‘key’ that matches the shape can unlock it. In the same way the Old Testament is like a lock. The specifications of the ‘Christ’ are not just in these two Psalms we looked at above but also in Abraham’s sacrifice, Adam’s beginning, and Moses’ Passover. But it is in the Prophets of the period 800-400 BC in the Old Testament that the specifications of the coming Christ become even more precise, allowing us to check whether Jesus really was this prophesied ‘Christ’ – which we do next. This entry was posted in Common Questions, Journey through the Veda Pusthakan (Bible) and tagged christ in bible, meaning of christ, what odes christ mean, who is christ on 08/01/2017 by [email protected]. We have seen how Abraham was, so very long ago, given a promise of nations. 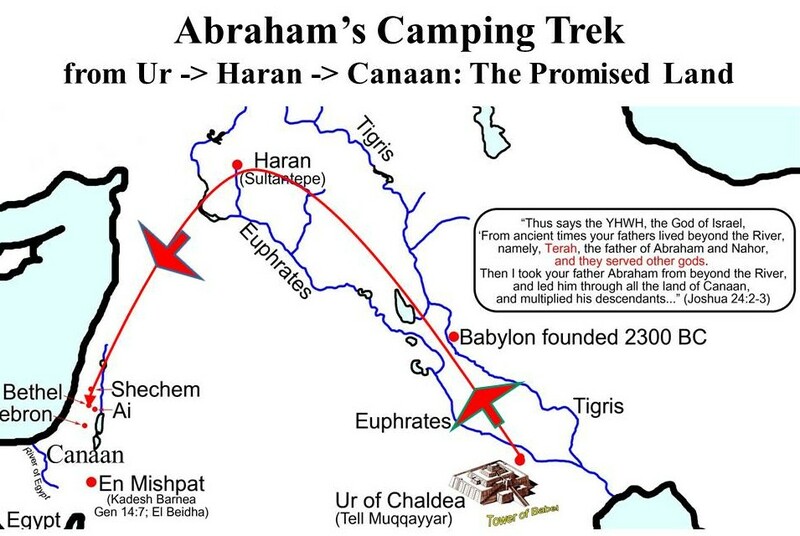 Jews and Arabs today come from Abraham, so we know the promise came true and that he is an important person in history. Because Abraham trusted this promise he was given righteousness – he achieved moksha not through rigorous merit but he received it as simply as one receives any free gift. Some time after, Abraham did receive that long awaited son, Isaac (from whom the Jews today trace their ancestry). Isaac grew into a young man. But then God tested Abraham in a dramatic way. You can read the complete account here and we will go over the key facts to unlock the meaning of this mysterious test – to help us understand how righteousness will be paid for. At the last moment Isaac was saved from death and Abraham saw a male sheep and sacrificed it instead. God had provided a ram and the ram took the place of Isaac. Abraham then names that place. Notice what he names it. Abraham named it ‘The LORD will provide’. Here is a question. Is that name in the past tense, present tense or future tense? It is clearly in the future tense. And to be even more clear the comment which follows repeats “…it will be provided”. This is also in the future tense – thus also looking to the future. But this naming occurred after the sacrifice of the ram (a male sheep) in place of Isaac. Many think that Abraham, when naming that place, was referring to that ram caught in the thicket and sacrificed in place of his son. But it was already sacrificed and burned at this point. If Abraham was thinking of the ram – already dead, sacrificed and burnt – he would have named the place ‘The LORD has provided’, i.e. in the past tense. And the comment would have stated ‘And to this day it is said “On the mountain of the LORD it was provided”’. But Abraham clearly named it in future tense and therefore was not thinking of that already dead and sacrificed ram. He was enlightened to something different. He had insight into something about the future. But what? In other words, ‘Mount Moriah’ in the early Old Testament time of Abraham (4000 BC) was an isolated mountain top in the wilderness but 1000 years later through David and Solomon it became the central city of the Israelites where they built the Temple to the Creator. And to this very day it is a holy place for the Jewish people and the capital of Israel. The arrest, trial and crucifixion of Jesus happened in Jerusalem (= Mount Moriah). The timeline shows the events that have happened at Mount Moriah. Let us now think back to Abraham. Why did he name that place in the future tense ‘The LORD will provide’? How could he know that something would be ‘provided’ there in his future that would so precisely mirror what he enacted on Mount Moriah? Think about it – in his test Isaac (his son) was saved from death at the last moment because a lamb was sacrificed in his place. Two thousand years later, Jesus is called ‘Lamb of God’ and is sacrificed on the same spot! How could Abraham have known this would be ‘the spot’? He could only have known and been able to predict something that remarkable if he had received enlightenment from Prajapati, from the Creator God himself. It is as though there is a Mind that connected these two events by location even as they are separated by 2000 years of history. The sacrifice of Abraham was a Sign – pointing forward 2000 years – to make us think about the sacrifice of Jesus. 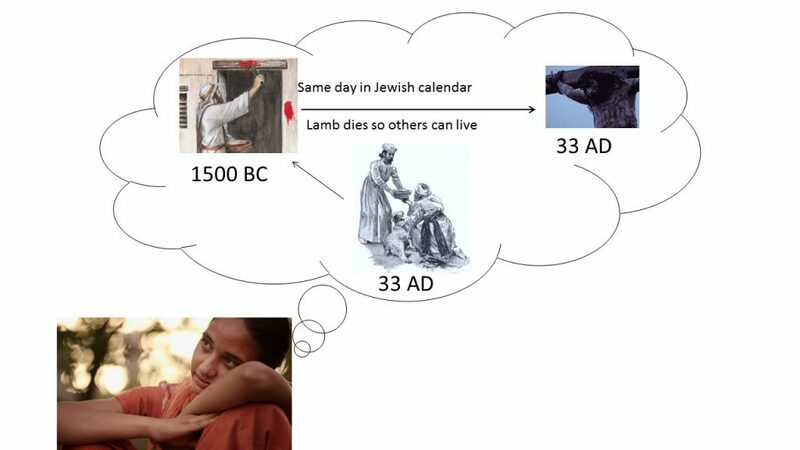 The figure illustrates how the earlier event (Abraham’s sacrifice) alludes to the later one (Jesus’ sacrifice) and was configured to remind us of this later event. This is evidence that this Mind (Creator God) is revealing Himself to us by coordinating events though separated by thousands of years. It is a Sign that God spoke through Abraham. Do you not belong to one of ‘all nations on earth’ – no matter what your language, religion, education, age, gender, or wealth? Then this is a promise that is given specifically to you! And notice what the promise is – a ‘blessing’ from God himself! This was not something solely for the Jews, but for people all over the world. How is this ‘blessing’ given? The word ‘offspring’ here is in the singular. It is not ‘offsprings’ as in many descendants or peoples, but in the singular as in a ‘he’. It is not through many people or a group of people as in ‘they’. This parallels exactly the Promise given at the beginning of history when a ‘he’ would ‘strike the heel’ of the serpent as recorded in the Hebrew Vedas and also parallels the promise of the sacrifice of Purusa (a ‘he’) given in the Purusasukta. With this Sign the very place – Mount Moriah ( = Jerusalem) – is predicted giving further detail to these ancient promises. The details of the drama of Abraham’s sacrifice help us understand how this blessing is given, and how the price for righteousness would be paid. How is the Blessing of God obtained? This is another way of saying that the sins we do produce a karma that results in death. But death was paid by the lamb substituting for Isaac. Abraham and Isaac simply had to accept it. He did not and could not merit it. But he could receive it as a gift. This is exactly how he achieved moksha. This shows the pattern we can follow. Jesus was the ‘Lamb of God who takes away the sin of the world’. This includes your own sin. So Jesus, the Lamb, offers to ‘take away’ your sins since he made the payment. You cannot merit this but you can receive it as a gift. Call to Jesus, the Purusa, and ask him to take away your sins. His sacrifice gives him that power. We know this because it was foreshadowed beyond that of chance coincidences in the remarkable account of the sacrifice of Abraham’s son on Mount Moriah, the same spot where 2000 years later it ‘was provided’ by Jesus. This entry was posted in Journey through the Veda Pusthakan (Bible) and tagged abraham and enlightenment, abraham and samadhi, meaning of sacrifice of Abraham, rsi abraham, sacrifice of Abraham on 01/20/2014 by [email protected].